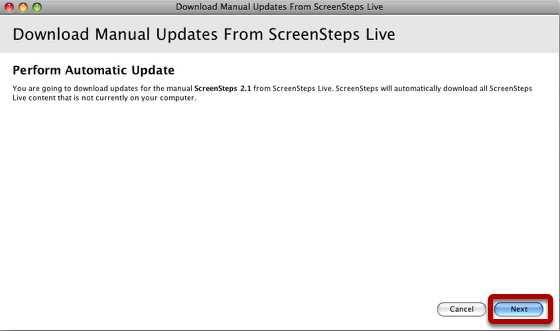 ScreenSteps Desktop 2.9 and Workgroup DocumentationScreenSteps Desktop & WorkgroupScreenSteps 2.9 Working with ScreenSteps LiveHow do I Update My Local Manual With Changes From the Version on my ScreenSteps Live Account? 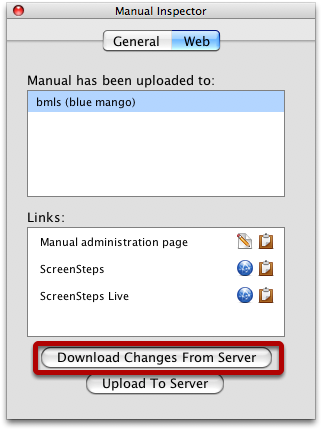 This lesson will teach you how to download changes to your manual from your ScreenSteps account. If you are collaboratively working on a manual as a team it is advised that you do this each time before you working on a manual. This will ensure that you have the latest content.. Select the manual you want to update (1) and open the inspector (2). Select the Web tab (1) in the inspector. 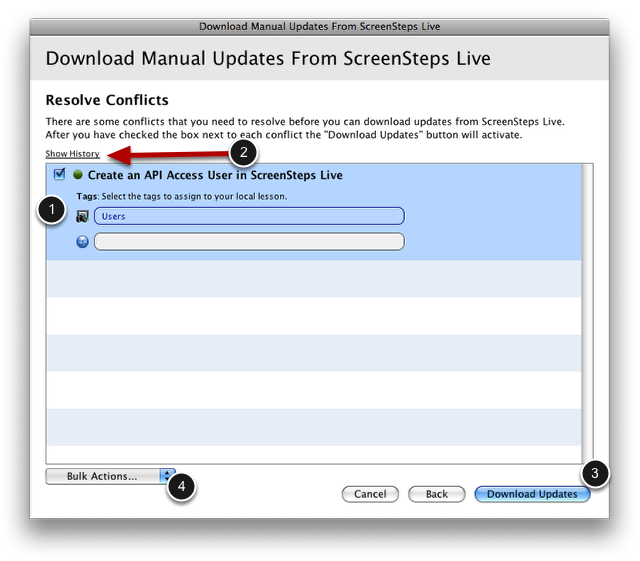 Select the ScreenSteps Live from which you wish to download changes (2). Currently only Automatic Syncing is available. What does this mean? 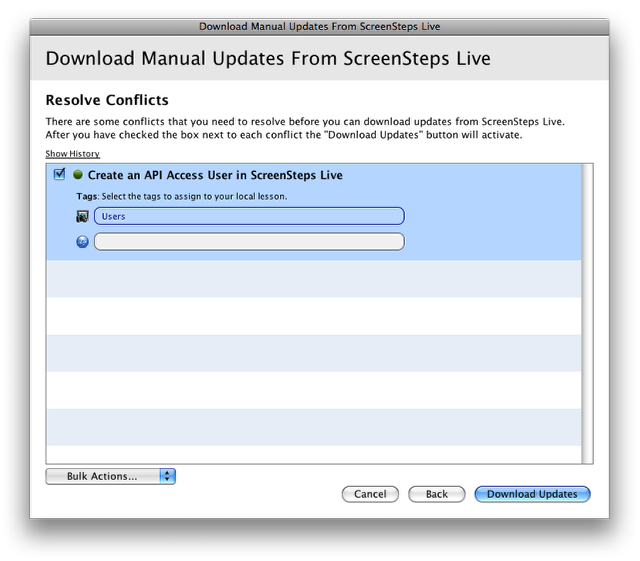 Automatic Syncing merge the chapter structure between your local version and the version on ScreenSteps Live. You will still be able to determine how you want your actual lesson content to be updated. 1. If there are conflicts then a list of conflicts will appear. 2. Click the Show History link to view the history of edits for the selected lesson or chapter. 3. The Download Updates button will not be enabled until all conflicts have been resolved. 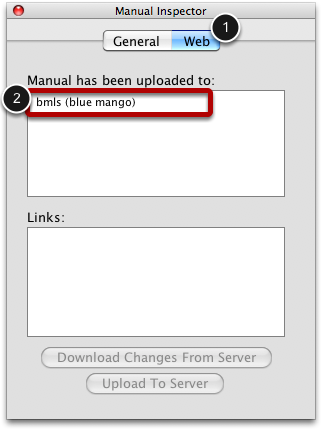 Tip - You can quickly accept all changes from the server by selecting Accept all server changes from Bulk Actions (4). • Content Conflicts: The actual lesson contents are different. • Meta Data Conflicts: The tags or status setting a for a lesson are different. In this example I have decided to keep the server version. Once all of the conflicts are resolved, click Download Updates. Your local manual will be updated. Prev: How do I Upload a Manual to ScreenSteps Live from ScreenSteps Desktop?